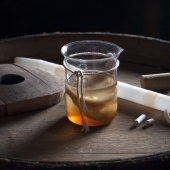 "The age-old craft of vinegar making is marked by legacy and patience." Our story begins in the 1980s, when Rozendal owner Kurt Ammann was still making wine – and enjoying success with his acclaimed Bordeaux blends. One fortuitous year, Kurt discovered that his 1988 vintage contained slightly too much volatile acidity, and this ‘flaw’ proved a happy accident – providing the perfect opportunity to venture into vinegar making. Intrigued by the quality and health benefits reported by advocates of raw, artisan vinegar; Kurt began his own endeavours with 2000 litres of ‘flawed’ wine and a commitment to time-honoured, natural processes. These were processes so slow that they would span generations – with Kurt’s children now bottling vinegars birthed by their father. 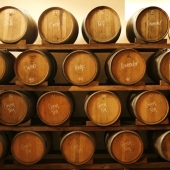 We employ the traditional French Orleans method of vinegar making: Wine is cultured by an indigenous “mother” (the acetobacter) from the first vinegar made on Rozendal in 1988, and allowed to ferment naturally in small oak barrels. Select ingredients are crucial to quality – we start with good, balanced red wine (and not the dregs or caramel additives common in the vinegar industry). 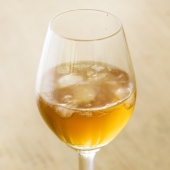 The balsam is then matured for up to 20 years in oak barrels, which allows it to soften in taste. Aging takes place over a solera system; a complex maturation method that relies on fractional blending of old vinegar with the new to ensure that the character of the original vinegar permeates every bottle. Finally, we bottle small batches using a gentle gravity-flow system, leaving the vinegar to evolve and mature further in the bottle. Our slow processes yield a beautifully balanced, balsamic style vinegar good enough to drink neat – and indeed, a daily shot of the tonic is the morning norm on Rozendal Farm. This invigorating ritual is enjoyed for its taste, but also for its health benefits: Raw, naturally fermented vinegar helps to restore the body’s PH balance, by reducing the excess acid that results from our modern lifestyles.